The Ferrari F1-2000, designed by Rory Byrne, was a direct development of the F300 and F399 (the constructors championship winning car from1999) of the previous two seasons. It had the same basic gearbox but a new engine featuring a wider 90 degrees V-angle to lower the cars centre of gravity. The aerodynamics were improved to make it more competitive with that year's McLaren. The 51st season of Formula One was to feature seventeen races and the 2000 title battle would be a close contest between Mika Häkkinen, the reigning world champion driving for McLaren, and Michael Schumacher who won 9 races out of 17. It was Schumacher’s third title and Ferrari's first World Driver's Championship for 21 years. Jody Scheckter was the Scuderia’s last drivers champion way back in 1979. Rubens Barrichello finished fourth in the championship with Ferrari successfully defending their Constructors' title. This car started a period of absolute dominance lasting till mid-decade. Five successive drivers championship! The season was marred by the death of race marshal, Paolo Ghislimberti, who was killed by a loose tyre at the Italian Grand Prix at Monza after a crash involving The two Jordans. This caused Michael Schumacher to considered retirement, it had been the first death in F1 since Ayrton Senna's in 1994. 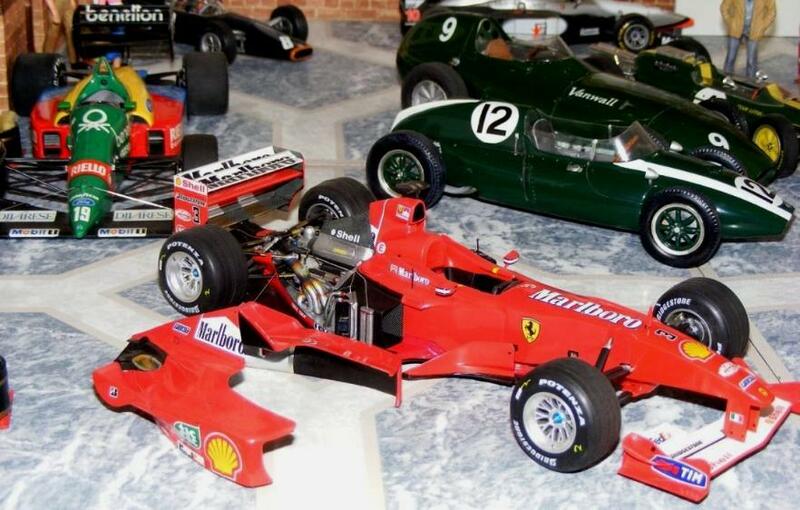 The Ferrai F2000 kit is another of Tamiya's fine model kits. Easy to understand and build, the parts fit well and moulding is as good as ever. If there is a down side to this kit it is the ejector pin marks being prolific and some in visible places. That is a particularly problematic if you are trying to use the clear body version to it's best effect. Ian built this along side a 1/12th scale MG Model Plus kit and the Tamiya kit was by far the better of the two. Detailing has been achieved with various after market products but is essentially from the box. Body colour is by Halfords acrylic car spray paints, thisi time using VW Mars red. The detail painting is all done with Humbrol enamels and Citadel acrylic paints and inks.